Ruby, ruby, ruby....that is what’s on the lips of boating anglers this week and inside many mouths as people get the chance to get amongst the tasty red fish found in deep waters on the calm days with little tidal movement. One such lucky angler is Jodie Anderson who is pictured this week with her first ruby. Jodie and her partner Callum are avid anglers and enjoy fishing throughout the year in Exmouth. The couple have lived in Exmouth for years and are often seen at the tackle store and boat ramps. This capture was a highlight for them and a new species to add to the variety caught in Exmouth. Many people catch Ruby jobfish on electric reels and some people think electric reels are far too easy. However, it does take good boating skills and fishing knowledge to land your bait in the right place, not to mention finesse with hooking up and strength if bringing the fish up using a gimbal belt. It can take a long time to reach the ocean floor in deep water and if you have missed your target area due to current, wind or human error, then it’s a long way back to the surface and an even longer time to reposition. The good part is that if you do get a good fish, you really only need one or two because they are so big and tasty! Learmonth Jetty has had great schools of hardy heads congregating around the pylons lately. You can see small bream and the odd mangrove jack from the jetty, while queenfish have been screaming in and snavelling up any opportunity to grab a bait. The black ink on the jetty is a sure sign that squid have been about and it’s always a good idea to have a squid jig in your tackle box incase they show up. Small soft plastics cast far away from the jetty and let drop to mid water, then a fast retrieve is a tip from one angler to catch the queenfish. Small trevally can come through at times as well, while shovel nose sharks can be seen cruising the shoreline. A fishing session at Learmonth can be very productive and it’s a lovely beach for the family to enjoy as well. The guys from Diversity Charters have been getting great catches of rankin cod and red emperor this last week, while there was a few coral trout on the menu for keen spearfishing crew. The waters have been exceptionally clear and perfect for diving, with great visibility. Quite a few local spearfishermen have been getting in to the deeper waters and selecting red emperor for the dinner table. Spearfishing is a great way to be fit and see exactly what is in the area you are fishing. We would like to finish this report with a tribute to the late Steve Pitman who passed away this week. Steve has been a resident of Exmouth for many years and member of the Exmouth Game Fishing Club for over 30years. Steve loved his fishing and in particular his game fishing using light line classes. Last year Steve fished with his daughter Sahra in the international tournament here in Exmouth prior to his cancer being diagnosed. Steve was so proud of his daughter, who won Champion Angler for the event. Steve will be sadly missed by many here in Exmouth, and our thoughts are with his friends and family, especially his two daughters Alyse and Sahra. Are you a keen billfish angler? Have you seen many big sailfish? You just have to check out this week’s pic of a sailfish caught off Exmouth recently by visiting angler Amy Hyett: it is huge! I have never seen such a fat sailfish. In fact on first glance it almost looks like a blue marlin because of its stature, but it is definitely a sailfish and could have been an all-tackle world record? 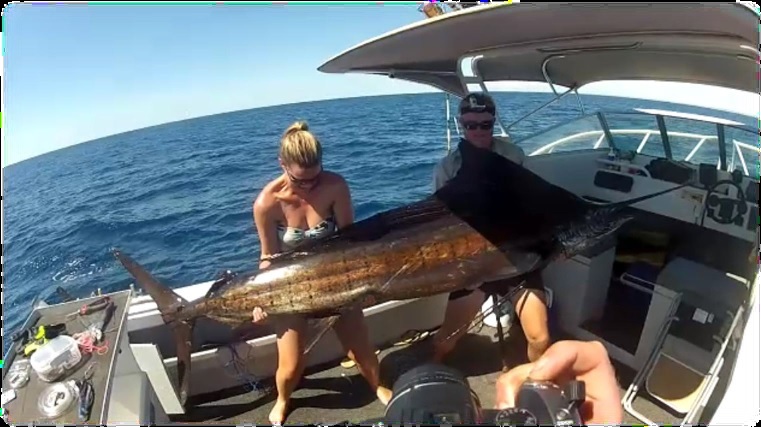 The fat sailfish was caught using a 12inch Pakula lure in 300-400m of water off Tantabiddi (the area known as The Steps). Amy was using an 80lb Shimano Torsa 20 outfit. Interestingly, they said that trolling a string of Emu Export cans as a teaser seemed to raise the fish! The crew caught other fish in the area, but this beauty was Amy’s first sailfish, and one she will never forget. Tuna have been thick lately in both the gulf and west side, with large schools of long tails in the gulf and a mix of striped tuna and yellofin around the west side. These can be great fun for juniors and adults and small Christmas tree lures with sharp single hooks work well for these fish when trolled a long way astern. The fish are feeding on small baits, but will take to these surface lures. Keen sport fishing anglers have been getting on to the stick baiting at the back of the reef on the west side and getting into some red bass and giant trevally. The weather and swell ahs been calm enough for this, however, as we head in to winter we expect the swell to pick up and advise any anglers taking on this challenge to take extra care. This area can be hot or not, with some days producing a few good follows and others none. It can be tide dependant and some anglers prefer certain moon phases. There’s one thing that is for sure, if the fishing is not good, there is always some reason you can use! Shore based anglers have been reporting good numbers of garfish this week. Garfish can be great fun, especially for the juniors. With school holidays coming up, why not drop in to Tackle World and ask what rigs to use for your rod and reel to chase these fun fish. Berley is recommended and prawns are great bait for garfish, along with small long shank hooks and a float. As many of you know, I personally haven’t been out fishing as much in the last year with the arrival of our baby boy, Kalvin. He turns one this week (already!) and prior to his birthday we took him out for his first day marlin fishing and camping on the boat. He got to see some amazing sights and reminded me how lucky we are here in the northwest. The weather was sensational and the water clarity amazingly deep blue/purple. We found a bait ball from top to bottom in 94m of water north of Long Island that had a massive manta ray gorging on it. We tagged two black marlin that day and saw some great birds, seasnakes, tuna, even a whale that seemed lost at this time of year. We were very grateful for the day with the fresh clean air, the ocean plentiful, the birds active and seas calm. The Pannawonica Sporting Club held their inaugural fishing and spearing competition recently that was proudly supported by many local and Western Australian businesses including Tackle World Exmouth. There are many keen anglers that live at Panna and the event was enjoyed over two weekends by 40 competitors from 13 teams, which included 4 juniors. Catches included wahoo, mackerel, red emperor, spangled emperor and trout from the bluewater section, while mudcrabs, cod and jacks were amongst the creek captures. The spearfishing competitors got some great fish too, with Tom Wood taking out Champion Spearo. Aiden Taylor won Champion Angler Junior with some quality creek species including a 1.5kg mudcrab. Champion Bluewater Team was won by True Blue, with angler Kane Armstrong onboard who also took out Champion Angler. Spanish mackerel have not been responding well to lures this week, however spearfishermen have been getting in to some thick schools and selectively taking one home for dinner. Ross Lawrence is one such angler and is pictured this week with a cracking Spanish mack. The waters are cooling and thankfully there have been no more irukandji reports and there are not expected to be anymore with these cooler temps. It was extremely unusual for there to be so many reports of stings so far south. As we head in to winter, it’s always a pleasure to see some of the familiar seasonal faces returning to Exmouth. Many of the retirees who come here each year have already been hitting the shores in search of the whiting, spangled emperor, bluebone, squid and other tasty delights. Incoming reports include whiting, flathead and bream around Learmonth Jetty, while one gentleman was not happy about there being no squid in an area reported the previous week. We all know, that ‘fishing is fishing’ and it can change at any time. There is also that element of ‘luck’ in fishing: sometimes it can be good, other times, bad. We know one thing for sure though: we are very lucky here in the northwest with such variety and opportunity. As we head in towards winter we expect the mackerel to be showing up in the higher water column in bigger numbers, and this has been the case in the last week. Shallow running lures have been working well, especially in the early morning and late afternoons. If you’re reef fishing during the day, a floated scalie mackerel bait can often result in a mackerel bite too. Large giant trevally have been biting on the shoreline as well with the recent cooling in temperatures. The access roads at the tip of the cape can be a good area for this, especially if you are willing to put in some time walking through the sand and across the rocks. The beach at the tip of the cape can be good for casting soft plastics, metals and poppers to target other species like queenfish, giant herring, northern salmon, cod and at certain times, you can get shark mackerel come in close there with the deep water so close. 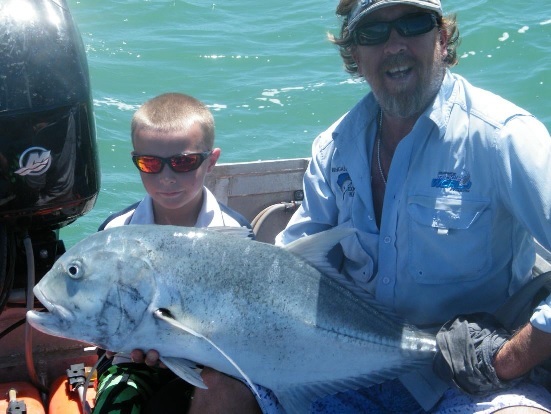 Fly fishing anglers have been getting amongst the golden trevally while wading the west side. This week there was a film crew here from Wales with Welch actor Julian Lewis Jones as the main host. They got into some fly fishing, as well as sport fishing with Eddy Lawler from Peak Sportfishing. The fishing with Eddy was so full of action with so many species that the guys had sore arms from catching and casting so much during the day. They also went out with Exmouth Dive and Brad Norman to swim with the whale sharks and had an awesome experience with three different sharks in the one day. The film crew are doing a 1hr series on Australia with Exmouth being the grand finale. Coral trout have been prevalent lately on both the west side and in the gulf. They have been taking to jigs in shallow water, as well as small deep diving minnows. Coral trout can be tricky to catch, but when you get one, it is well worth the persistence as they are very tasty indeed! The premiere Australian Junior Billfish Tournament is on the weekend of May 18th and 19th. We are expecting it to be a great weekend for junior anglers and encourage all interested juniors to get a team together with mum’s and dad’s. If your child is keen and you don’t have a boat, there will be plenty of other adults willing to assist, so get down the Exmouth Game Fishing Club and enquire with other anglers. What an amazing report we have for you this week. I always comment on how lucky we are in the northwest with such a great range of species, and the high probability of seeing fish with such abundance and good weather opportunity. Not to mention the close proximity of the launching facilities, which gives you less time travelling, less cost of fuel and more importantly, more time fishing. This last week has seen an amazing new world record. Angler Brett Cannon is a TV host in the USA and accomplished angler. He and a mate called Kitt from Miami decided to target what is called a ‘Royal Slam.’ This is catching 9 species of billfish. The extra part to this though, is they wanted to do it in record time. The standing record was the 9 species in 36days. Brett started his Royal Slam in Kona, where it took him 8 days to catch a spearfish. The next day he caught a pacific blue marlin, then jumped on a plane to pursue an Atlantic blue marlin. This was achieved in the Dominican Republic, along with a white marlin and an Atlantic sailfish. 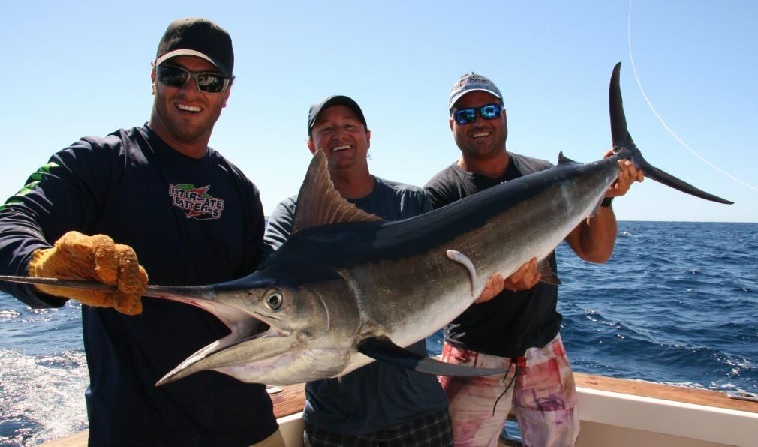 They then flew to Port Stephens in NSW to get a black marlin, but after three days with no results, they then flew to Cabo San Lucas and caught a striped marlin, then back to Miami and caught a pacific sailfish and a broadbill swordfish. Five minutes after catching the swordfish, Brett rang Captain Josh Bruynzeel from On Strike Charters here in Exmouth (and it was midnight over here at that time!) So....36hrs of travelling later, Brett was then on his way out of Exmouth marina to target a black marlin. It was mid afternoon and needless to say, Brett was a little jetlagged! They didn’t manage to get a marlin that afternoon, and the next day they had one that jumped off. Pressure, pressure, pressure!! Then at 11am the following day, they tagged a black marlin to complete the Royal Slam in a record 26days. This equates to a species of billfish every 2.88days. Half an hour after the capture, they caught another fish for Brett’s travelling companion Kitt. This then completed Kitt’s Royal Slam as well! What an incredible effort. Great to see that Exmouth was a part of it all? Squid have been about lately and anglers black stained feet and clothing is always a good guarantee that they have been getting caught. Dave Holbery from Perth has been catching some from the southern side of the marina of an evening, while visiting anglers from Perth were catching them during the day from the shore in the gulf. The rains and strong winds have dirtied up the gulf quite considerably and the swell has been rather messy for boating enthusiasts. The marina and canals is always a good option when the winds are strong and swell messy. Plenty of different anglers have been getting in to the various cod, jacks, bream and trevally in this area with small baits and lures. Most fish are small and great for fun and release, with the odd fish a thumper that can be challenging to land. The first-ever Australian Junior Billfish Tournament is on this weekend, so why don’t you get down to the clubhouse to see and encourage these kids to enjoy the skills, team effort, scientific input and fun that comes with tagging and releasing billfish.